Tyler Miller prepares to distribute the ball. The goalkeeper passed up a chance to play for Major League Soccer’s Seattle Sounders and is instead testing European leagues. 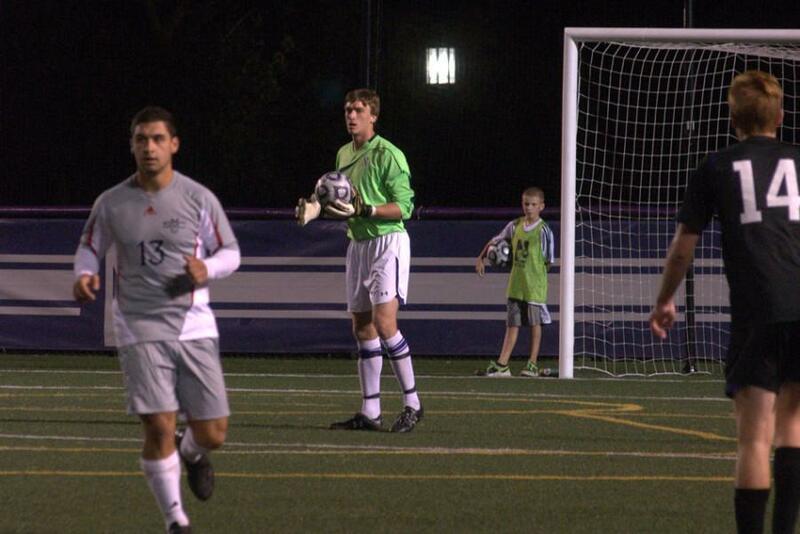 Tyler Miller played four seasons of unbelievable soccer as Northwestern’s goalie. An All-America Second Team and three-time All-Big Ten First Team selection, Miller’s last season as a Wildcat ended with a 0.58 goals against average, a .854 saves percentage and 9 shutouts. He was also unanimously named Big Ten Goalkeeper of the Year. But Miller always knew his career wouldn’t end after college — he has big dreams of representing his country in the Olympics someday — and he’s willing to do whatever it takes to get there. Before one of his daily evening practices with German soccer team SVN Zweibrucken, Miller sat down with The Daily to talk about life post-NU and pre-Olympics. He discussed his future, his path to Germany, which included bypassing getting drafted by Major League Soccer’s Seattle Sounders and his desire to explore the European leagues. The Daily Northwestern: What was it like for you after your last game against Southern Illinois, and then in the next few days realizing your college career was over? What has it been like being away from NU? Tyler Miller: It was a great four seasons at Northwestern. My first year couldn’t have started any better. We won the double Big Ten Championship, and it was the first time in school history. It was obviously a huge deal and to be a part of that and to have such a significant role in the Big Ten Tournament was exciting for me. Every year just got better and being able to make the NCAA Tournament every year was a lot of fun. After the last game, it was difficult, but I knew that college soccer wasn’t the end for me. I knew that there was always going to be an option to play professional soccer so I kept positive and kept training. The Daily: You were drafted by the Sounders but chose to go to Germany. Can you tell me a little about your decision and why you eventually chose playing in Europe versus staying in the United States? Miller: I just felt like Europe was the right decision for me at the time. It’s difficult and there were a lot of aspects that went into it. I’m young, it was the right time for me to test the European market, and if things don’t work out, I’ll head back and play in the MLS. The Daily: Talk about SVN Zweibrucken. How’s your season going? Have you been able to play much? Miller: We didn’t win a game in the second half of the season, got relegated down to the fifth league and finished in last place, unfortunately, but the guys are trying to stay as positive as they can. I’m trying to work as hard as I can and I’ve played in every game so far. But this summer, I’ll be leaving to find a new club, and I’m not sure yet where that will be. The Daily: You’ve always talked a lot about how your teammates and coaches at NU became like a second family. Have you been able to build those types of relationships in Germany, even though you haven’t been there long? Miller: There’s a few guys on the team that I’ve become close with, and I live in an apartment with three other guys, it’s me, Nikko (Boxall, Miller’s teammate at NU) and then one other guy, so I’m building closer relationships with them. It’s nice to have some friends here besides Nikko. The Daily: In March, you were named to the US Under-23 Men’s National Team. That was your first call-up to U-23. Tell me about your training camp experience and your hopes for 2016. Miller: It was a nine-day training camp, four days were in Bosnia and then next five days were in Denmark. We played Bosnia and ended up beating them 5-2, then went to face Denmark, and I got to make my debut in the second half. We lost that game 1-0, and I gave up the goal, but after the goal I played really well, I was really confident, and I think I kept our team in the game with a few important saves. It was a really amazing experience to be able to represent my country on such a high level. There’s another camp coming up in Toulon, France for the 2015 Toulon Tournament at the end of May that I was invited to, and then Olympic qualifying is next fall. I definitely want to get into as many camps to show why I deserve to be on the team. The Daily: What’s one thing you’re looking forward to when you return back to the States even if it’s just for a few days? Miller: Seeing my family and a cheeseburger. Really looking forward to having a nice cheeseburger. Or some type of American food that you can’t find here.